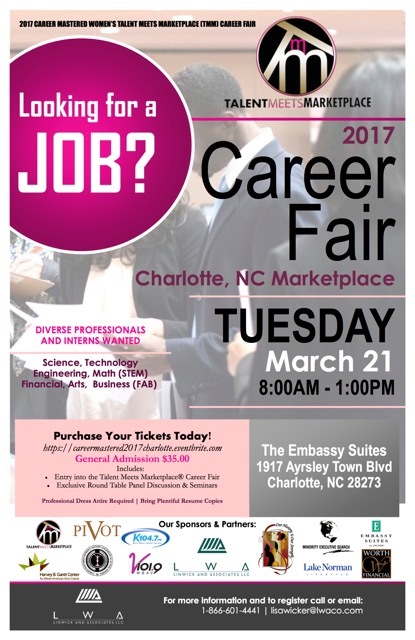 Talent Meets Marketplace Career Expo registration offers attendees access to Career Mastered premier employment recruiting expo where Fortune corporations participate to recruit top talent for employment and internship opportunities. Attendees will meet with company representatives and network with others. Attend with the possibility of attaining even higher levels of career success. Meet top executives of some of the biggest companies at Talent Meets Marketplace – the Career Mastered Student Competition. Do you have a business mindset? Are you creative? Are you passionate about shaping the future of your career? Then you are definitely in the right place! Get ready to meet corporate executives and leaders to showcase your talents in a one-of a kind problem solving case competition. You will compete for a fascinating summer internship experience at one of the participating companies. We invite you to Career Mastered Talent Meets Marketplace – SHAPE YOUR OWN CAREER AUDITIONS AND BUSINESS NETWORK. Together with experienced company representatives you will take part in a problem solving business case competition in areas such as Technical Data, Coding, Future Trends, Finance, Business, HR, Marketing. Logistics. As a student, you are going to present your ideas and solutions in front of members of the participating sponsoring company. A summer internship will be awarded to the student with the best ideas and presentation. Selected students will be announced and invited to attend the Career Mastered Receptions and Awards Gala that evening. As a participating company, you will develop your problem solving business case (we will provide guidelines), provide three company judges for the auditions, select the student(s) you will choose for summer internships, provide the offer to the student(s) that day, attend the Career Mastered Reception and Awards Gala. Bronze sponsorship is required for this participation. Students will be selected by the various corporations that choose to participate. If you are selected to participate, you will be contacted and provided the specific details and time period for completion of the process prior to the TMM Auditions. Your university will be contacted to verify your current status. TMM Student Competitions will be held on March 1, 2017 in the Detroit , Michigan Marketplace and March 21, 2017 in the North Carolina Marketplace. Each company will be provided with guidelines to develop the case for students to solve. The case will be provided to the students you select from the applicants. Your company will provide 3 judges for the student competition auditions. Your company judges will make the selection of those student(s) that you will provide an internship offer to after the auditions, on-site. The selected student(s) will be recognized during the Career Mastered Women’s History Awards Program that evening. A member of your team will be available for photos during the program on March 1, 2017 for the Detroit Michigan Market or March 21, 2017 for the North Carolina Market.